What is a fraction and examples? The word fraction means a part of something that is whole i.e. its value should be less than 1. 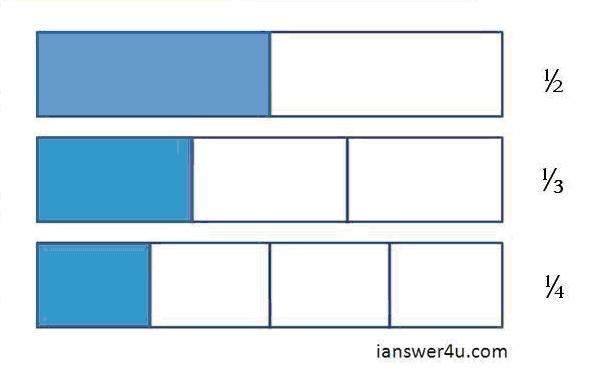 Fractions are a type of rational numbers (which are of the form p/q, where p and q are integers and q≠0), and have numerator less than the denominator (p < q) and both p and q are in the lowest terms. A fraction is in the lowest terms if the only common factor between the numerator and denominator is 1. Eg. 5/10 is not in the lowest terms since the common factors are 1 and 5; whereas 3/7 is in its lowest form. A fraction can be treated as a division problem. 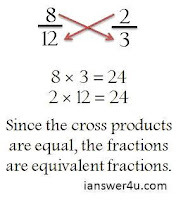 Two fractions are said to be equivalent if the cross products are equal. Cross product is the product of the numerator of one fraction with the denominator of another. Those fractions in which the numerator is one. Eg. 1/2, 1/3, 1/4 etc. • Like fractions are those which have the same denominators. 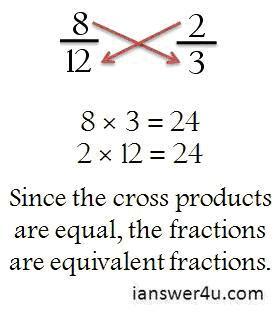 • Unlike fractions are those which have different denominators. • Fractions in which the numerator is less than the denominator are known as proper fractions. Eg. 3/4, 5/10, 3/9 etc. • Fractions in which the denominator is less than the numerator are known as improper fractions. Eg. 5/4, 9/8, 11/2 etc. • Fractions which are a combination of a whole number and a fraction are called mixed fractions or mixed numbers. Mixed fractions are an example of improper fractions. Improper fractions can be converted into mixed fractions and vice versa.